The two U.S. Senators from Texas took opposing positions on the Senate GOP's long-awaited plan to overhaul the American health care system Thursday. WASHINGTON — Republican leaders in the U.S. Senate on Thursday unveiled their plan to overhaul President Obama's 2010 health care law. Within hours, Texas' two Republican senators took opposite positions on the measure. 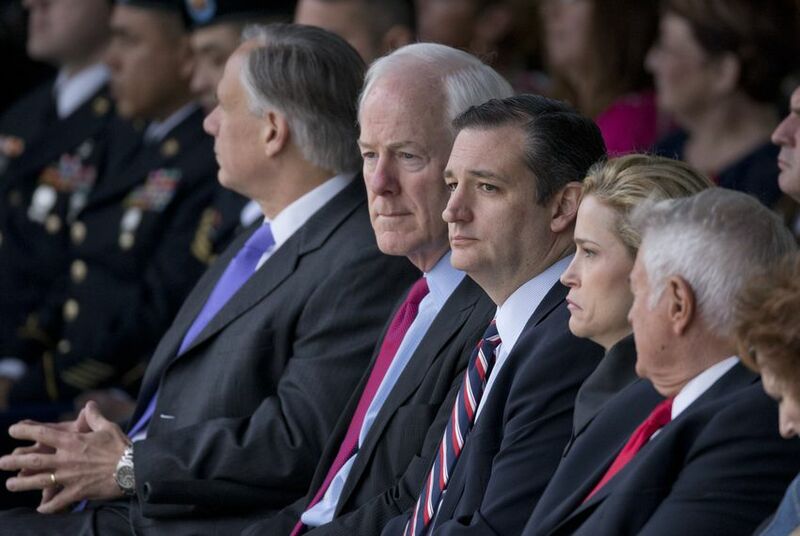 While U.S. Sen. John Cornyn took to the floor early Thursday to defend the bill against Democratic criticism, U.S. Sen. Ted Cruz joined a bloc of conservative senators who announced in the afternoon that they couldn't back the bill at this time. “Currently, for a variety of reasons, we are not ready to vote for this bill, but we are open to negotiation and obtaining more information before it is brought to the floor," Cruz said in a joint statement with U.S. Sens. Rand Paul of Kentucky, Mike Lee of Utah and Ron Johnson of Wisconsin. "There are provisions in this draft that represent an improvement to our current health care system, but it does not appear this draft as written will accomplish the most important promise that we made to Americans: to repeal Obamacare and lower their health care costs," they added. But Cornyn, a member of Senate leadership, fought hard for the bill on the Senate floor Thursday morning. There are 52 Republicans in the U.S. Senate. Republicans need at least 50 of them to support the bill to pass it, assuming Vice President Mike Pence casts the tiebreaking vote in their favor. On the Senate floor Thursday, Cornyn singlehandedly defended the bill at length against several disgruntled Democrats, including Minority Leader Chuck Schumer from New York, who criticized the way the Republicans crafted the bill. At one point, Schumer asked Cornyn if Republicans would agree to start over and craft a bipartisan bill. "If I thought that was a sincere offer, I would take it in a minute, a New York minute,” Cornyn said. "It's been made clear to us that you don't want to participate in the process." Cornyn called the Affordable Care Act a "failed experiment" that necessitates quick action from the Senate. Cruz, who has a history of creating trouble for GOP leaders, has positioned himself in recent weeks as something of a consensus-builder within the Senate GOP conference on health care. On Monday, he emphasized his willingness to compromise on the issue in an interview with the Tribune. His Thursday statement left the door open to supporting the bill with changes, but Senate Republicans — much like their counterparts in the U.S. House — are struggling to balance the policy priorities of conservatives and more moderate senators, as well as those from states that are heavily reliant on Medicaid. The Senate's bill, called the Better Care Reconciliation Act of 2017, would eliminate both Obamacare's individual mandate that requires individuals to show proof of health insurance when filing their taxes and its requirement that employers with 50 or or more employees have to provide insurance. The bill would also phase out certain health benefits that insurance plans are currently required to provide, such as preventive care screenings, emergency room visits, maternal and newborn care and lab tests. The plan does keep some of the Affordable Care Act's most popular provisions, including barring insurers from denying coverage based on pre-existing conditions and allowing people to stay on a parent's health insurance plan until age 26. It would also factor a person's age into how much money they are eligible to receive from the federal government to pay for health insurance. But the bill also proposes sweeping changes to how the federal government and states work together on Medicaid, the health insurance program for the poor and disabled. Adriana Kohler, senior health policy associate at Texans Care for Children, said in a news release that the health care plan is "absolutely devastating" and would leave millions of Texans — particularly children — uninsured. "The Senate proposal makes deep cuts to Medicaid for Texas children, seniors, people with disabilities, and pregnant women," Kohler said. "The vast majority of Texans enrolled in Medicaid are children, and this plan is a direct attack on their health care." Republicans are proposing to cap how much the federal government spends per patient, leaving states to figure out how to pay for costs beyond that. In addition, the bill would allow states to both implement work requirements for Medicaid beneficiaries and ask those beneficiaries to provide more proof throughout the year that they are still eligible for the program. The Obama administration previously shot down these ideas, asserting that Medicaid is not supposed to be a work program. They also said at the time that multiple proof-of-eligibility deadlines increases the likelihood of Medicaid beneficiaries to fall off the rolls. Some Texas advocates said Thursday that the proposal would increase the number of uninsured people in the state, thanks largely to the changes in Medicaid rules and subsidies. Anne Dunkelberg, associate director for the left-leaning Center for Public Policy Priorities, said the proposed changes to Medicaid were alarming. She pointed out that 16 percent of Texans are in the program and said the proposed health law would likely mean millions of people dropping off the rolls. "The big sleeper, which I'm seeing more and more of the news picking up on, is to what extent the both House and Senate bills are ending Medicaid as we know it," Dunkelberg said. Jose Camacho, executive director for the Texas Association of Community Health Centers, said it will be days before advocates understand the full impact of the proposed law. He said people are already struggling to pay for health insurance even with the subsidies they have now. "We're always worried about the clientele," Camacho said. "Most are the working poor, they work in hourly jobs that don't provide access to health care, so we're always concerned about that." Senate GOP leaders have made clear that they want to wrap up the health care issue by the coming July 4 recess, making the next week a crucial one. Disclosure: The Center for Public Policy Priorities and the Texas Association of Community Health Centers have been financial supporters of The Texas Tribune. A complete list of Tribune donors and sponsors is available here.